Quadrant Engineering Plastic Products (Quadrant EPP) has announced a new series of Stable Machining Grade (SMG) materials, developed to improve the performance and productivity of parts made from polyolefin base materials. Quadrant EPP has utilized its R&D capabilities to create the new materials—each to be launched over the next 6 months. “Quadrant’s considerable technical experience helped to meet customer needs that simply hadn’t been addressed by anyone in the market. Each of these new materials stretches the boundaries that may have existed for machinable shapes manufactured from PP (polypropylene) and PE (polyethylene),” said Doug Mahler, Product Marketing Manager. Research was done at several facilities in Quadrant’s North American operations area, including Scranton, PA; Reading, PA; Delmont, PA; and Fort Wayne, IN. The new materials each have a special performance characteristic, such as dimensional stability, higher temperature resistance, or enhanced purity. Each formulation was developed based on market feedback—some of it segment specific—that helped researchers better understand the problems machine builders were having with existing, traditional olefin formulations. The products will be released in March and June of 2017. Each will hit the market with inventory already in-place, along with a suite of collateral and training materials. For over 70 years, Quadrant Engineering Plastic Products (Quadrant EPP) has been proving there is simply no substitute for quality and innovation. Quadrant EPP is the global leader in research, development, and manufacture of machinable, high-performance engineering polymer materials. Quadrant EPP materials are specified for use in food processing and packaging, semiconductor manufacturing, aerospace, electronics, chemical processing, life sciences, power generation, and diverse industrial equipment. Quadrant EPP products range from UHMW polyethylene, nylon, and acetal to ultra-high performance polymers that resist temperatures to over 800°F (425°C). Quadrant EPP technology is backed by a global team of application development and technical service engineers, specializing in evaluating designs and fabrication techniques. Quadrant EPP materials expertise is available through a worldwide network of branch offices, technical support centers, and authorized dealers. 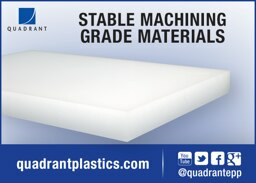 Learn more about Quadrant EPP at www.quadrantplastics.com or connect with Quadrant EPP on Facebook, YouTube, and Twitter ("quadrantepp”).